A slightly powered up version of the R40 mower, the R43, is also a pedestrian mower, and this one is a bit on the expensive side. To secure the possession of this machine, you will have to cough up a sum of about 480 pounds. Naturally, John Deere won’t make an expensive product, and not deliver an excellent one, and, surely enough, the R43 has features that are quite in tune with its price. For this one, we have B&S recoil-start 4-stroke engine that starts immediately with a single pull of the cord. 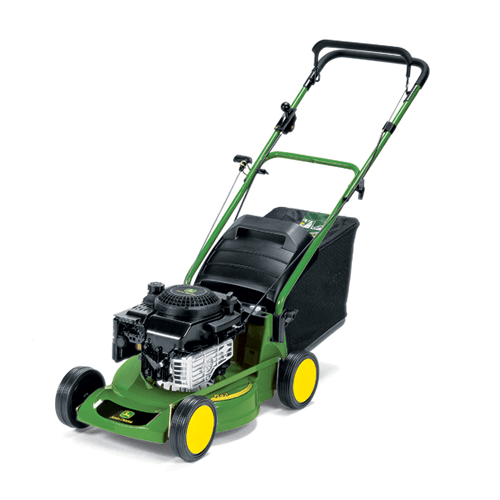 This mower packs quite push too, and it’s rated to 5.5hp, enabling the cutting of even the sturdiest grass and weeds that you may come across. The mower is also very light and mobile. You are faced with the same polyethylene deck that is guaranteed to last at least 15 years. It is 17 inches wide (43cm), so you’re again looking at a small lawn-oriented mower, despite the powerful engine. Be that as it may, the extra inch will let you wrap up work all the sooner. The mower sports a padded, adjustable handlebar for more convenience, and the deck’s height can be adjusted too (30-80mm). As with the R40, it’s a central cutting height adjustment system. When it comes to clippings, you have the option of either bagging them (45-litre bag) or discharging them. You can also pick up a mulching kit, but that is going to seriously raise the price, as the mower is expensive enough already. A neat little feature you have with this mower is that it has a bag full indicator LED – a small, but very useful thing to have. In the end, John Deere R43 Push Mower is certainly one of the better machines you can see on the market. It has a good, reliable engine that will ensure the mower cuts with ease. The 17-inch deck is perfect for suburban lawns all around, and the plastic deck makes it light and maneuverable, but still strong enough to endure the punishment you’ll put it through. It can’t mulch, just like the R40, and we don’t think it will be very cost-effective if you do buy the mulching equipment, but, other than that, this is a splendid mower.